Presentations are shared at the biannual PAC Connection Meetings. See the most recent presentations on postabortion care. Announcing CEFOREP as the Francophone PAC Secretariat! This statement emphasizes the joint commitment to including family planning in postabortion care. The curriculum includes evidence from more than 15 years of research in postabortion care. Read the brief focused on postabortion family planning. E2A recently published technical briefs and an assessment report summarizing its assessment of PAC services in Burkina Faso, Guinea, Senegal and Togo. A review article titled, Postabortion Care: 20 Years of Strong Evidence on Emergency Treatment, Family Planning, and Other Programming Components, was recently published in the Global Health: Science and Practice journal. Cross-country exchanges on PAC systems development. French instructions for navigating the Global Resource Package can be found here. This article evaluates whether a community engagement and service-strengthening intervention raise awareness of family planning and early pregnancy bleeding, and increased family planning and postabortion care use. This article focuses on USAID's Postabortion Care Program. This document includes results frameworks and a menu of indicators for global and country programs. The PAC Global Resources Guide provides comprehensive, standardized scientifically accurate, and evidence-based information on postabortion care. It serves as a repository of basic instruments intended for policymakers and program planners who are designing or revising their current postabortion care program. 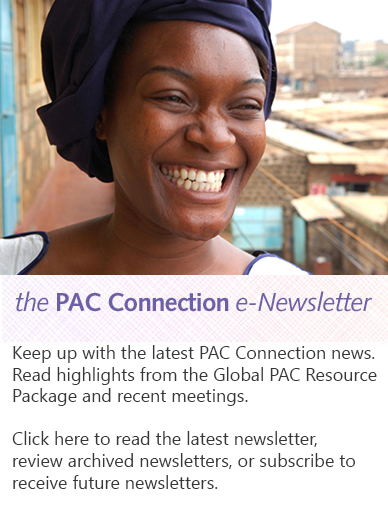 Are you a new user to the PAC Global Resource Package website? If so, watch this short video to acquaint yourself on the available resources and tools. View highlights from the PAC Connection Meetings. View key presentations from previous PAC Connection Meetings.